POPULAR LOCATION! HOME ESTATE AGENTS are proud to offer for sale this stunning four bedroom extended semi detached family residence situated on one of the areas most desirable roads. Boasting an extensive southerly facing rear garden & being in genuinely beautiful condition we feel an early viewing is essential. In brief the accommodation comprises hallway, bay fronted lounge, extended dining room/family room, modern fitted kitchen, downstairs WC, shaped landing, the four well proportioned bedrooms, & an impressive four piece bathroom suite. The property is warmed by gas central heating & is fully uPVC double glazed. To the front of the property there is a driveway providing ample off road parking leading to a storage garage. The rear garden is a real treat & ideal for a growing family. South facing, with a paved patio area & generous lawned garden beyond. Perfectly located for popular schools & amenities. 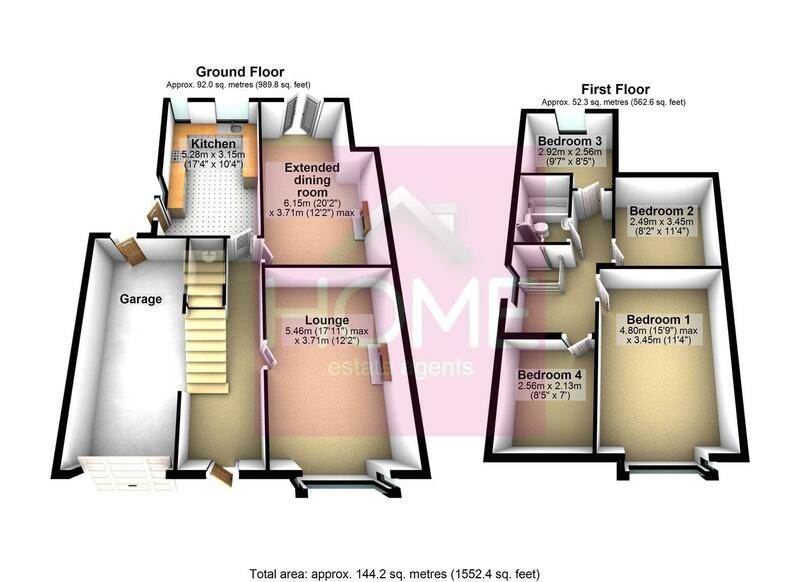 To book your viewing & avoid missing out call HOME on 01617471177. Door to front and uPVC double glazed opaque stained and leaded window to front. Wood effect flooring. Stairs to first floor. Meter cupboard. Picture rail. Coving to ceiling. Central heating radiator. UPVC double glazed box bay window to front. Marble fireplace housing electric fire. Wall lights and coved ceiling. Television point and picture rail. Double panel radiator. UPVC double glazed French doors to rear. Coving to ceiling and television point. Double panel radiator. Fitted with a range of wall and base units with black granite rolled edge work top incorporating one and a half bowl sink unit with mixer tap. (Under mounted sink). Space for automatic washing machine. Space for cooker. Upright radiator. Spot lights. Two UPVC double glazed window to rear and UPVC double glazed door to side. Comprising low level WC, wash hand basin and tiled to complement. Extractor fan. UPVC double glazed box bay stained and leaded window to front. Built in wardrobes with hanging and shelving space. Double panel radiator and picture rail. UPVC double glazed window to rear. Wood effect flooring. Double panel radiator. UPVC double glazed window to rear. Upright contemporary radiator. Wood effect flooring and television point. UPVC double glazed window to front. Wood effect flooring. Picture rail and double panel radiator. A four piece suite comprising, low level WC, wash hand basin. Tiled panelled bath and shower cubicle. Tiled to complement. Ladder style radiator. Tiled floor. Spot lights. UPVC double glazed leaded opaque window to side. To the front of the property there is a printed concrete driveway providing ample off road parking leading to a storage garage. The rear garden is a real treat & ideal for a growing family. Starting with a paved patio area with lawned garden beyond. There is a storage shed which has been used in the past as a home office. Up and over door to the front. Door to the rear. Power and lighting. We have been advised that the property is Leasehold with a ground rent of £7.50 is payable annually.